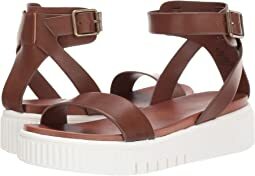 MIA® shoes were founded in 1976 at the height of the disco craze as a classic Swedish clog resource to the United States. With years of established and proven commitment to quality, this privately owned company has become one of the leading fashion footwear resources of children's shoes and young contemporary designs. 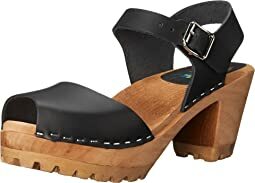 Established for over 30 years, MIA was the first shoe company to bring clogs to the fashionistas of that time. Importing from Brazil, Italy and the Orient, MIA shoes deliver season after season, a superior combination of quality and comfort in their fashionable shoes for the trend-conscious consumer. 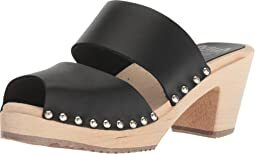 Offering a wide selection of trend-savvy heels, flats, sandals and boots, MIA shoes are both stylish and completely wearable. 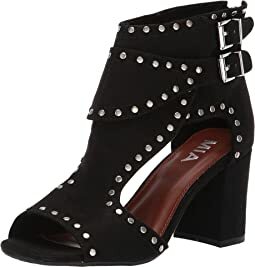 MIA shoes is based in Miami and New York with a dedicated team of designers constantly searching for the newest trends and one-of-a-kind items that will drive their MIA customers wild. From footbeds to flats, high heels to huaraches, MIA is one stop shop for today's young woman. The MIA girl is both practical and inventive in her fashion choices. MIA's heels, flats, sandals and boots range from their super-comfortable classic collections, to key styles that are in every fashion editor's must-have list. 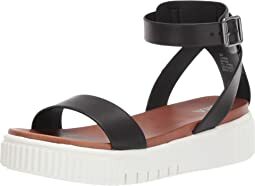 Season after season, MIA shoes offer a great array of trendy, of-the-moment shoes as well as tried-and-true basics that stand the test of time with a hint of retro style. No matter what age or style, MIA heels, MIA sandals, MIA boots and MIA flats are all about variety and fun. These are very cute but very uncomfortable. They didn't fit my foot correctly. The heel strap was too big and could not be adjusted to fit. Unfortunate because the style is very cute. I love these shoes. I don’t like completely closed in shoes much at all, so these are great for me. I put a foam insole in them to make them more comfortable. I also have the open toe ones. The fit is a half size small like others said. So order a half size larger than you normally wear. I love these shoes just ordered another pair. I did put a foam insole in it, makes them more comfortable I also have the other one with closed toes. I love them too! These are good-looking, but I couldn’t keep them on my feet. I need a heel strap. These are soooooo cute, and I think they would be very comfortable - if they fit. My feet were kinda swimming in them, my feet aren't very narrow, but they are NOT wide - these would fit a wider foot perfectly I believe. bummed that I have to return. Love the rocker-style of this shoe and the heel is just the right height. The studs and the double buckles.... just WOW!!! LOOKS AMAZING ON!!! Great shoe but sending back...this is not what I expect from a $100 purchase. These are gorgeous shoes. A tad wide so if you’re wide they’re good and the leather is soft. 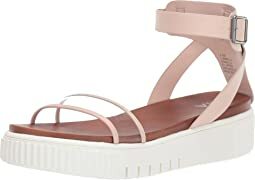 Usually wear a size 6, bough a size 7 per the brand recommendation and if fits perfect! I’m typically a 8.5, ordered the 9 and then the 10 after the 9 was too tight. Similar to other reviews, the 10 fit in the foot but the straps were too long. So bummed because the shoes themselves are darling! Returned both pairs. I’ve never bought from this brand before, but I really liked the look of the shoe and I’m pretty happy about the purchase. 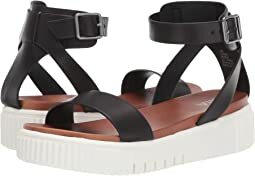 They are super cute and versatile, and most importantly I found them really comfortable. I am a pretty standard size 6. I ordered a size 6. They are pretty true to size but are on the small side of a size 6. Hopefully that makes sense. 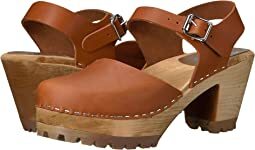 I'm a 6.5 but in clogs (Dansko, Anna) I'm a 36. The 36 is a true 6 so they were too short for me. I didn't bother to try the 37 so I don't know if they'd fit or not. Hope this info helps. I should've listened to the reviews but thought I'd give these shoes a try. They were super cute but unfortunately I had to return them because they were too small. Love love love these! Usually anything with a wooden sole takes me awhile to break in, but not these. 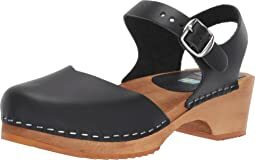 I've owned much more expensive pairs of clogs/wood heeled shoes and these are by far the most comfortable, with the best price. These are terrific, especially for the price point. 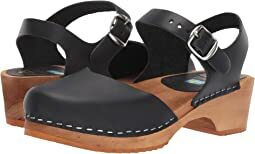 I have been a fan of a wooden soled sandal for a long time and I am pleased to add these to my collection. The red leather is a cheery shade and is just the right balance between sturdy and soft. The staples are placed in an orderly fashion. The wood is not finely sanded across the whole shoe, but it is sanded where my foot touches. That seems like a fair trade-off for the price, especially since the bottom of the shoe will get exposed to the street, etc. The rubber on the bottom of the sole has a nice grip to it. Oh! 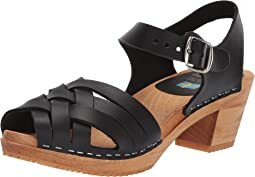 They are fairly lightweight compared to other wooden sandals I have owned, which is nice. These fit true to size for me. I wasn’t sure I would like these but I actually like them more in person! They feel very cushioned, but I’m not sure if the strap across the toes will rub - time will tell. 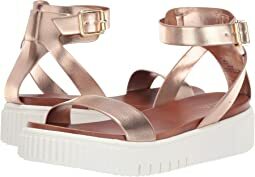 Cute if you are interested in trying the sport sandal trend. I bought these for my daughter for her birthday and she loves them. We did read the reviews and ordered them a full size larger than she normally wears and they fit perfectly. And true to fabulous Zappos service-they arrived less than 24 hours after I ordered them !!! 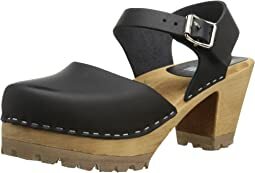 I wear a size 8.5 and all of my clogs are 39. I ordered the 9 and I'm thankful I did. The clogs have 39 carved in the sole like all of my other clogs. These are amazing for the price! You get what you pay for. Very stiff, foot is sliding all over the place. Might be better for pudgy feet. Going back. Loved the shoes!! Gave it 5 stars, but sent it back because it felt a half size too small. Maybe they need to make it wide and in double wide widths also. Lovely shoes. I look forward to receiving the new pair that will be a size up from my normal fit which is a size 7W. These shoes were very comfortable and cute! They fit TTS.